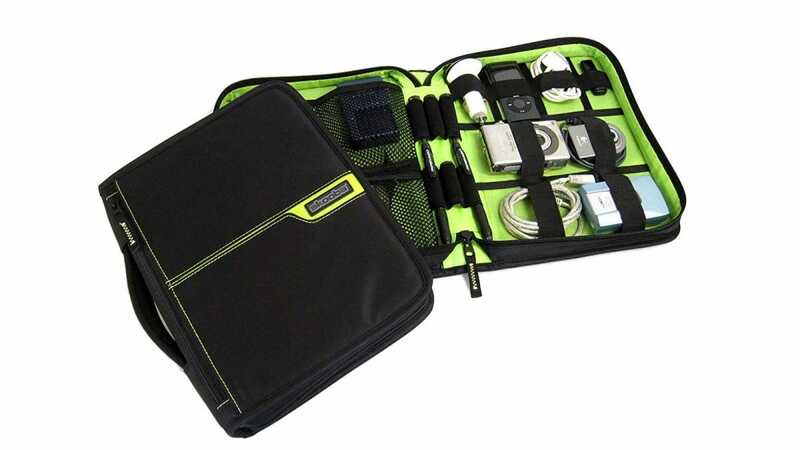 To keep all your cables, chargers, SD cards, batteries, and assorted extras from getting lost in the bottom of your bag, you need some sort of system to keep them organized. Let’s look at our favorites. 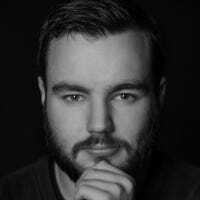 Over the last few years, I’ve noticed a kind of cable creep happen to me. I used to be able to travel with my Nokia charger and that was about it. Now, it’s not surprising to see someone lugging around a plethora of USB cables, three charging bricks, an external battery pack, a computer charger, a Chromecast, a camera charger, and who know what else. I’m one of those people— personally, I need to carry all the tech-extras for my iPhone, Kindle, MacBook, and DSLR; it adds up. There are lots of different systems out there that claim to keep all your tech stuff better sorted so let’s dig in and look at the best. There’s something that will suit every tech user. If you bring everything including your HD TV—or just have a clan of gadget-mad kids—the BUBM Double Layer Electronics Organizer is exactly what you’re looking for. This 10.7” x 8” x 1” gadget bag is big enough to fit an iPad and has an extra internal divider so you can store even more stuff. 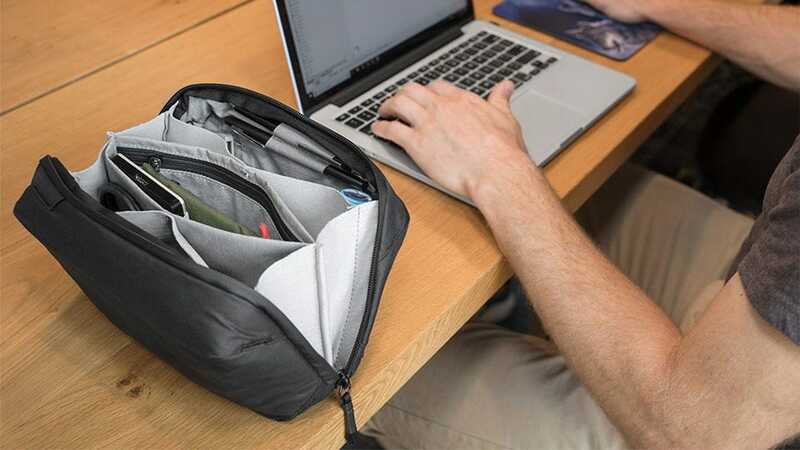 The BUBM uses a mix of elastic loops, pouches, and zippered compartments so you can carry any combination you want of cables, chargers, flash cards, USB sticks, and other tech gear. The only problem is that, at about an inch thick, larger charging blocks, external batteries, camera chargers, and some international plugs either won’t fit or will be awkward and blocky. If you just want to tame your unruly knot of cables, a Cocoon Grid-IT! Organizer is the best option. 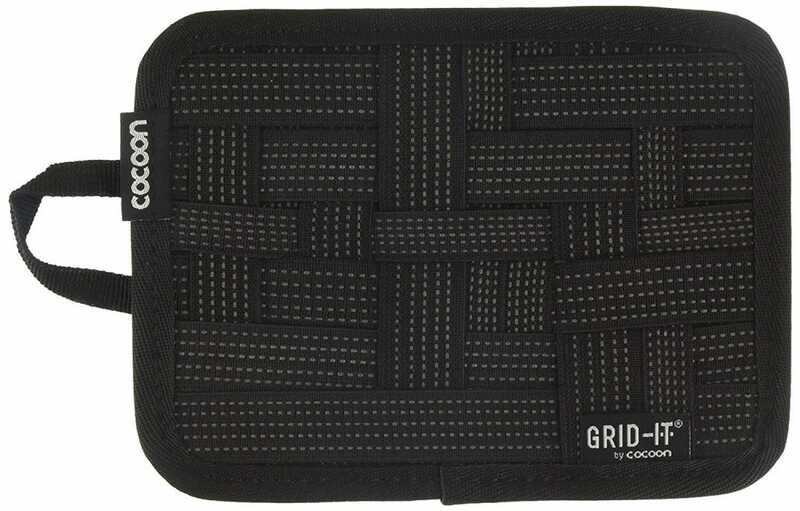 The Grid-IT! uses a crazy web of elastic straps that mean you can secure your cables however you want. Cocoon claims you can also use it to organize chargers, USB drives, and other, larger objects but really, having tried to do just that, it’s not quite true. It’s possible but it’s not convenient and I ended up just not bothering to try and squeeze my camera charger into a strap that wouldn’t hold it anyway. With that said, as a pure cable solution, the Grid-IT! is awesome. There are a few different sizes but we love the 5” x 7”. It’s small enough that you don’t even have to think about carrying it but still big enough to strap down all the cables your tech gear needs. At Review Geek, we’re big fans of Peak Design. Their products frequently make our Best Of lists with good reason. They always have the same caveat though: Peak Design gear, while incredible, is normally some of the most expensive in the category. The Peak Design Tech Pouch, at $59, is no exception. 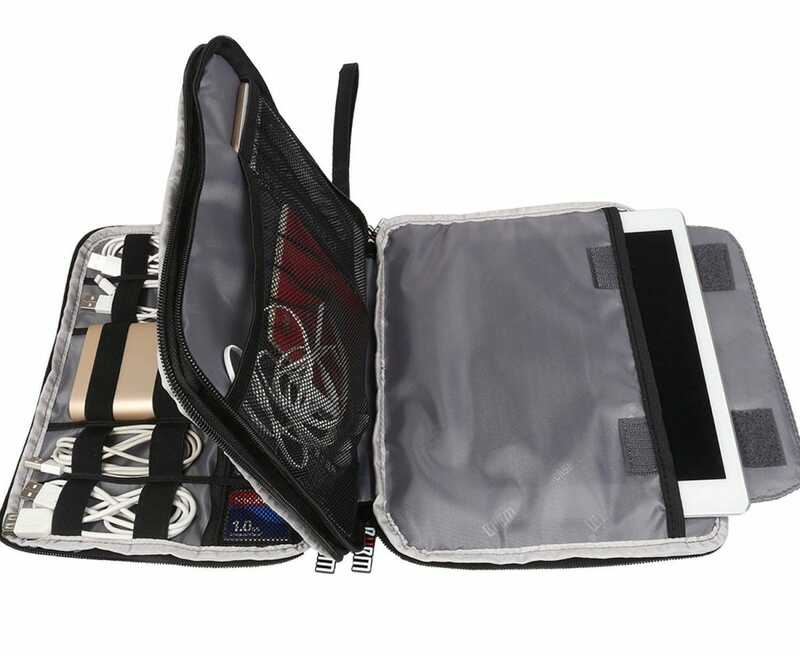 What sets the Tech Pouch apart is that, instead of using elastic straps or pouches, it has flexible internal dividers. At 9.4” x 5.9“ x 3.9”, it’s also a lot thicker than any of our other picks. 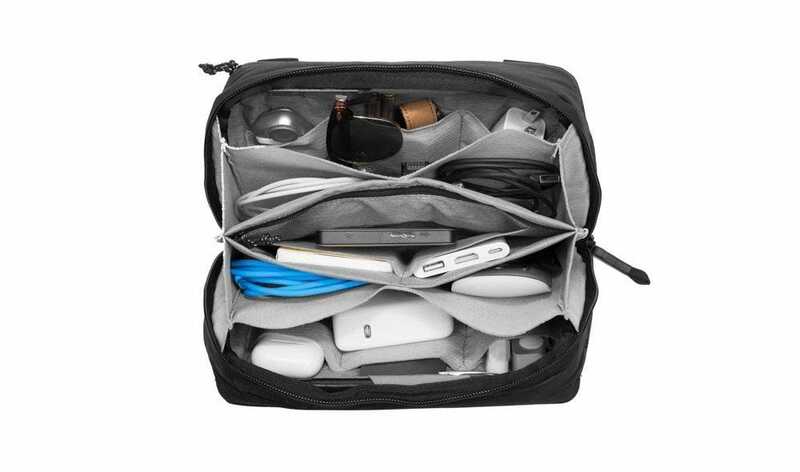 The combination of a bigger bag and flexible compartments means that the Tech Pouch is much better at carrying bulky items like laptop bricks, hard drives, camera chargers, and the like. It can really carry all your tech accessories. It’s also much simpler to use: you don’t have to worry about returning something to an awkward elastic strap, you can just toss it into any empty compartment. I found I actually used the Tech Pouch more than any other solution, especially when I was in a hurry. If you have a lot of bulky gear and don’t mind paying over twice the price of our next most expensive option, the Tech Pouch is best in class. If you just want to keep a few cables organized, it’s probably a bit much. To our minds, the best balance of storage capacity, ease of use, and price is the Skooba R750-300 Cable Stable DLX. At 12.2” x 9” x 1.6”, it’s a little bigger, and most importantly, a little thicker, than the BUBM. Without the divider, it has a lot less pockets and elastic straps but, unless you’re carrying an undersea cable’s worth of USB stuff, you won’t be hard up for somewhere to keep your charger. One nice touch with the Skooba is that there’s an extra zippered compartment on the outside front cover. This is the perfect spot for that one cable you always need to grab. While I love my Tech Pouch, at the price, I can really only recommend it to people who travel a lot or absolutely need what it offers. For everyone else, the Skooba Cable Stable DLX is the best bet.